If you’re planning to build a shed or barn in your Perth property, chances are you’re mind is a bit frazzled and confused as to which materials you should be using for your impending project. Should you go for a wooden shed? How about a steel barn? What specific design would offer the best benefits? These are probably just some of the questions hounding you. And you know what? The answer is actually pretty simple. The better choice is a steel barn. Fact of the matter is: steel is among the strongest and most durable building components today. It’s much stronger than wood and is a whole lot more efficient than many other materials out there. Steel is a popular choice among many construction companies. In fact, many of the large structures in Australia and even those in other countries use steel. And seeing how efficient these buildings are, it can be safe to say that using steel for your barn won’t be a bad idea at all. Aside from its undeniable strength and durability, there’s another advantage to using steel materials for your barn: it can offer greater protection. Steel has the needed features and capacity to withstand fires, rain, strong winds and other harsh conditions. In effect, it can be quite helpful in providing additional protection to your barn, thereby resulting to greater safety for the structure and its users. To make this possible, however, you need to make sure that construction is undertaken properly. Despite being a very strong and sturdy material, steel is surprisingly lighter compared to other components. Incidentally, it’s this lighter weight that makes steel more usable and advisable for building barns and other structures. These are just some of the main reasons why using steel for your barn can be a good idea. To make things even better, you might want to opt for steel shed kits that come from a trusted name in the industry. 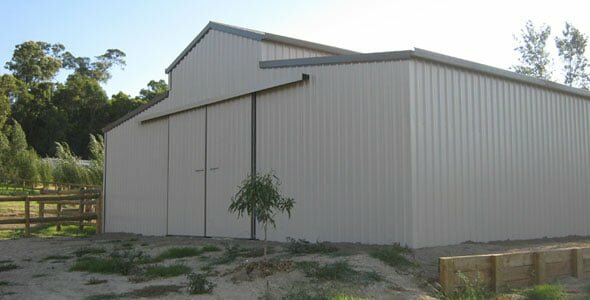 Do you want to use durable and efficient steel components for your Perth barn, storage shed or garage? Give us a call at 1300 778 628 for additional information.